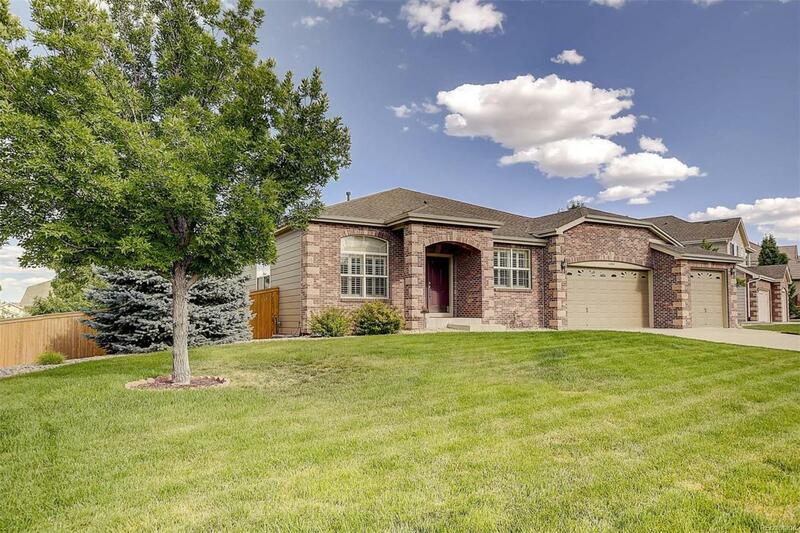 This immaculate ranch has been meticulously maintained! Features: main floor study w/ French doors, formal living & dining rooms, plush carpeting & gorgeous plantation shutters. The spacious family room has a gas log fireplace w/ tile surround. There's a well appointed kitchen featuring 42" stained maple cabinets w/ crown molding, an island, pantry, hardwood floors & black appliances. The main lvl has a vaulted study w/ private 5-piece en-suite w/ brand new quality easy care floors. There are 2 secondary BRs, a full bath & a generous laundry room w/ sink. The 3-car garage has finished walls & durable epoxy-finished floors. The walkout basement has been professionally finished comprising a bedroom w/ walk-in closet, 3/4 bath w/ upgraded tile, an enormous rec room w/ built-in media center & plenty of space for storage. There's also a spectacular yard on over 1/3 of an acre w/ mature trees & landscaping. Located in a quiet pooled community, you don't want to miss out on owning this home!